"This was my mother's standard dinner recipe for guests. These meatballs are juicy and packed with flavor! They go great with scalloped potatoes as a side dish." Combine applesauce, egg, bread crumbs, and salt and pepper, with ground beef; mix until well blended. (This is best done by hand.) Form mixture into medium-sized meatballs, and roll in flour. Heat 1 teaspoon of oil in a large skillet over medium high or high heat. Cook meatballs, turning occasionally, until evenly browned but not cooked through. Transfer to a baking dish and set aside. In the same skillet, partially cook the carrots and onions over medium high heat. Add tomato juice, season to taste with salt and pepper, and bring to a boil. Reduce heat, and simmer for 5 minutes, then pour over meatballs. Cook, covered, in the preheated oven for 45 minutes, or until carrots are tender and meatballs are cooked through. Cook uncovered for 10 minutes before removing from the oven. My grandmother made a recipe very similiar to this, although she used a can of condensed tomato soup/can water instead of the tomato juice. And no carrots, but I'm sure they'd be good too. The taste was ok...nothing fantastically woderful or anything. They did not stay together very well during cooking and serving. 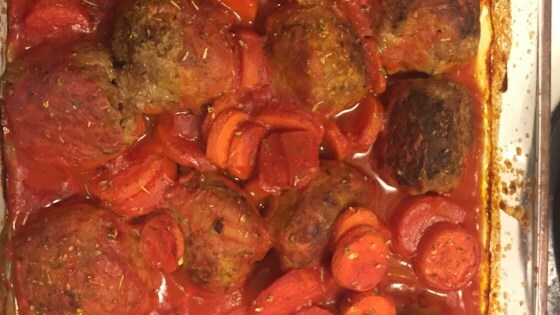 I am surprised at the other reviews, I have made this meatballs twice and my wife loves them. So does her friends. This was really good! The flavor was completely unexpected, but delightful. not my absolute favorite but my husband and kids loved it! Great spin on a classic recipe. These were very good. Not quite 5 star material though. The meatballs did not hold together very well, although dusting them with flour did make them brown nicely. The taste was very bland also. Would not recommend this at all. Loved this recipe. Delicious flavour and freezes well. I made this recipe with ground turkey, and they were delicious. A healthy meal for my toddler!